Liverpool defender Virgil van Dijk led the Netherlands to a crushing 3-0 win over Germany on Saturday in the Nations League to ramp up the pressure on German coach Joachim Loew. A first-half header by Dutch skipper Van Dijk gave the hosts the lead in Amsterdam. With the German defence in disarray, late goals from Memphis Depay and Liverpool’s Georginio Wijnaldum sealed the win on a golden night for the Oranje at Amsterdam’s Johan Cruyff Arena. This is the first time the Dutch have beaten Germany for 16 years and the comprehensive defeat leaves Loew under increasing pressure to resign after 12 years in charge. These are dark days for the Germans, still reeling from their woeful World Cup display when they crashed out early after finishing bottom of their group. Defeat in Loew’s 168th international means Germany are once again last — this time bottom of Group One in the Nations League. Van Dijk opened the scoring with a well-taken header after Ryan Babel had headed against the crossbar on 30 minutes. Depay then compounded Germany’s misery by stroking home a pass from Quincy Promes three minutes from time after the pair got in behind the defence. 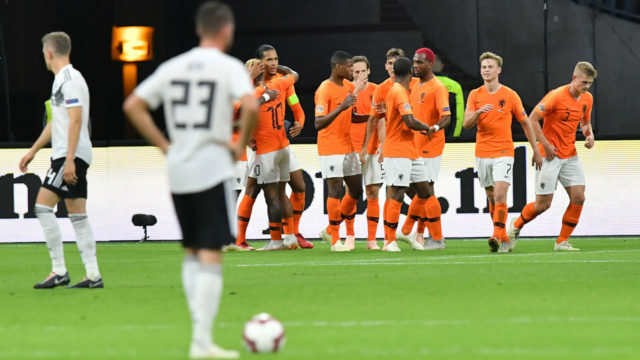 Depay then hit the Germany crossbar moments before Wijnaldum netted Holland’s third goal just before the final whistle. Germany now face world champions France in Paris on Tuesday and Loew can ill afford another heavy defeat. Earlier Saturday, Munich-based newspaper, the Sueddeutsche Zeitung, revealed there is a release clause in Loew’s contract, which runs until 2022, allowing either party to end the agreement prematurely. Loew had promised an improved performance from the Germans. Yet again, his senior players let him down as the Bayern Munich axis of Manuel Neuer, Jerome Boateng, Mats Hummels and Thomas Mueller struggled. Loew pulled a surprise before kick-off by starting Manchester City starlet Leroy Sane on the bench. Schalke striker Mark Uth made his debut up front with RB Leipzig winger Timo Werner and Mueller on the flanks. Loew opted for a 4-3-3 formation, just like his opposite number Ronald Koeman who started with Besiktas’ Babel, Lyon’s Depay and Eindhoven striker Steven Bergwijn up front. Uth and Werner both forced chances early on to keep Jasper Cillessen, Holland’s Barcelona goalkeeper, busy. The Dutch went ahead after 30 minutes when Babel out-jumped Germany midfielder Joshua Kimmich to the ball, headed onto the post and Van Dijk pounced on the rebound. Germany had their chances as Mueller and then his replacement Sane, who came on for the last half an hour, both fired wide with the goal at their mercy. Having broken the German defence in the final 10 minutes, Depay hit the net, then the crossbar before Wijnaldum swept in their third goal just before the final whistle.